We connect customers with licensed, bonded, and insured trenchless plumbing professionals for FREE. Every professional plumber faces issues related to damaged sewer lines and drains. If the problem is ignored or left to develop over time then the repair becomes more and more difficult to complete. Whether in a home or commercial business operation, if a pipe system were to blow up you can expect a major disruption. You may think that the only method of repair is to opt for traditional means of repair which means images of trench digging and massive property construction. However, the advancement of trenchless sewer repair technology for the past few years has dramatically changed how people perceive pipe repairs and replacements. Trenchless services provide the ultimate solution for new drain installations or repairing and replacing old and broken-down sewer lines. Sewer line repairs that use trenchless technology have so many more outstanding benefits. Modern equipment and superior materials used for pipe lining and pipe bursting allow plumbing experts to repair broken sewer pipes. The results are durable pipe systems that will not crack, rust, corrode, or fall apart due to tree root invasions. Trenchless plumbing experts can carry out the trenchless sewer pipe lining method in as little as a few hours. In doing so, your plumbing infrastructure becomes like-new and will last for decades to come. Labor cost goes down using trenchless plumbing solutions since less hours are needed to complete the trenchless operations. Sewer pipe lining saves residential and commercial properties in costs as compared to replacing the old pipe with a new one via digging trenches and replacing with the old method. 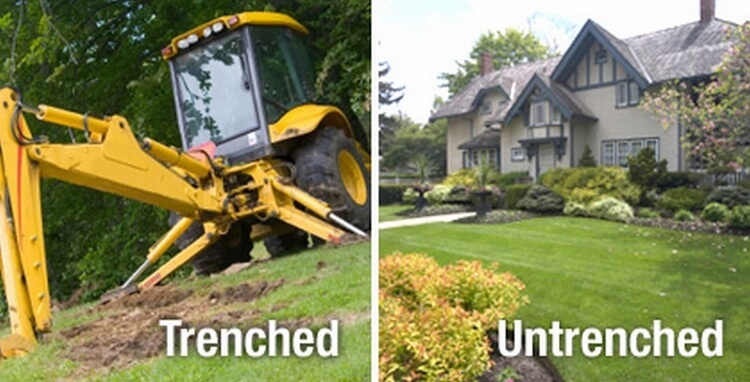 Trenchless USA offers Trenchless Hydro Jetting, Trenchless Pipe Bursting, and Trenchless Pipe Lining so that you don’t have to worry about your old sewer system any longer. Cured-in-Place-Pipe, or CIPP, is so much better than the old school cast iron or clay pipes. Apart from helping save the planet, you are bound to enjoy big savings in the long run by opting for ecofriendly trenchless operations from Trenchless USA. Maintenance of your pipes is extremely important and a yearly hydro jetting service will ensure that your pipes are always top notch. Trenchless pipe rehabilitation makes use of the existing pipe structure so that extensive excavation is not needed. Creating a trench, or a hole in the ground, to reach the problem pipe is not necessary. Pipes that are lined are durable and last as many as 30 more years. This is arguably the wisest investment you can make for your homes plumbing infrastructure that returns numerous benefits. Sometimes it might already be to late to rehabilitate a pipe system using the trenchless method and the sewer line could be damaged beyond repair. This scenario leaves even the best plumbing experts no choice but to manually dig up trenches to replace the pipes. Copyright © 2019 TrenchlessUSA. All Rights Reserved. *TrenchlessUSA is a Marketing Lead Generator. This site is directed at, and made available to, persons in the continental U.S. only.